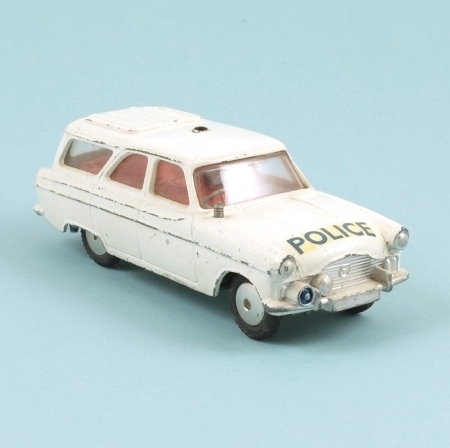 From the days when Britain's motorways were in their infancy, this Ford Zephyr is in white with silver bumpers and grille. The base is grey and the red vacuum-formed interior includes various tools, tow rope etc. There is a Police decal on the bonnet and tailgate in dark blue, a blue roof light, and a dark grey plastic aerial on one front wing. The wheels have shaped spun hubs and suspension,. This one is generally in good played-with condition with paint rubs on raised body lines, but it needs a new aerial and roof light. The tyres are original and in good condition.